Like most folks, you probably don’t think you have any potentially dangerous opioids tucked away in your medicine cabinet or under the sink. You may be surprised to find out you actually do – but didn’t know it. Different names are often used for the same drugs, which can make it difficult to tell exactly what you have at home – especially if you recognize the generic name, but didn’t know the brand name. If you’ve ever been treated for severe pain from surgery, an injury, or an illness, it’s entirely possible you still have prescription opioids in your home. Opiates and opioids are a class of controlled pain-management drugs that contain natural or synthetic chemicals based on morphine, the active component of opium. Opiates are naturally derived from the opium poppy, while Opioids are synthetic or partly synthetic drugs that work much in the same way as opiates – but their active ingredients are chemical. The National Institute on Drug Abuse classifies opioids in three ways: Natural, Semi-Synthetic, and Fully-Synthetic. Nitrogen-containing base chemical compounds, called alkaloids, that occur in plants such as the opium poppy. Examples are morphine and codeine. Man-made opioids but are created in labs from natural opioids. One example is oxycodone, also known as OxyContin. Completely man-made, such as Fentanyl or Methadone. 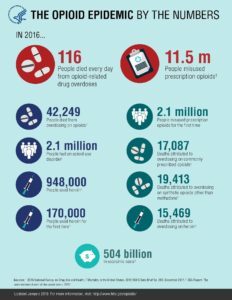 So what are common prescription opioids? And don’t just focus on the pills in your medicine cabinet: prescription opioids can come in several forms– tablets, capsules, liquids for injection, syrups, nasal sprays, skin patches, solutions and suppositories. If you are uncertain about any of the prescriptions you have in your home or just want to know if it’s an opioid, visit the U.S. National Library of Medicine website to search by brand name or generic name. You can learn more about the effect of prescription opioids at National Institute for Drug Abuse. Now that you know what’s in your medicine cabinet, we’ll tell you how to safely get rid of it in our next post. Hint: don’t flush it.